I’ve been working on Christmas gifts for various people for the last couple months. I’ve enjoyed the projects, but it has been killing me to not share these with you! 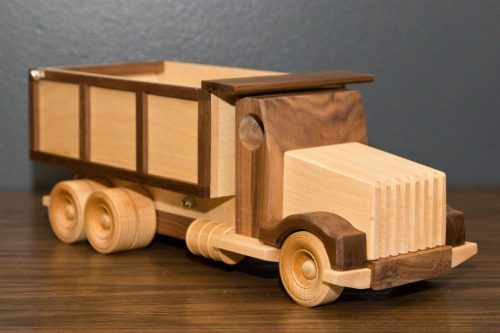 I’ll start with the biggest project first: Elijah’s dump truck. 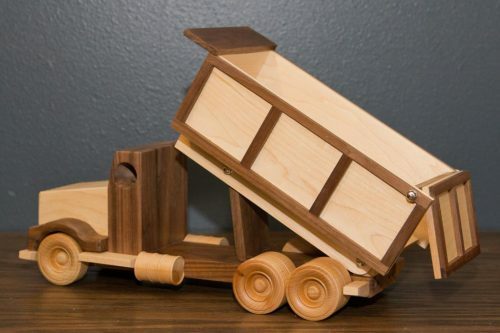 Last year I built Elijah a front end loader for Christmas. I decided to follow it up this year with a dump truck from the same series of plans. I ordered the kit which contained the wheels, axles and the hardware but everything else came out of a couple maple and walnut boards. The plans for this project could have been better, but I was eventually able to get it all put together and I’m really happy with the end result!